My motto is “Do what I like, in a way I like”. 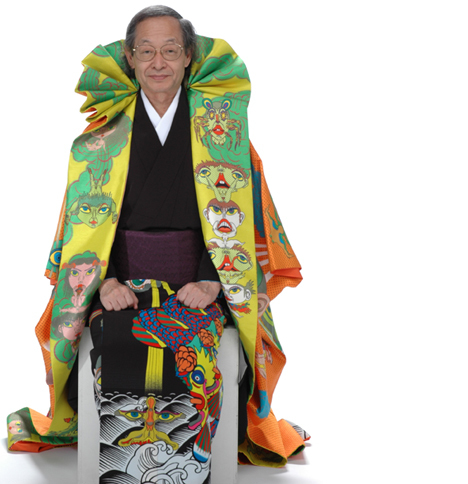 Below is an interview with a superstar in the Japanese Graphic Arts scene, Mr.Keiichi Tanaami, who started his carrier in the 60’s and is still active on the front lines. I was Born in 1936 in Tokyo. 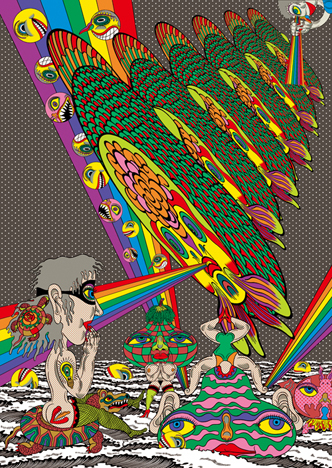 After graduating from Musashino Art University, I worked for Hakuhodo for a year and became involved in the underground scene which was full of fun creative activities such as animation, paintings, illustration, and editorial design. While I was primarily involved in design, I was also attempting experiments with video. The films I worked on were showing in places in the world like Oberhausen and Edinburgh. In 1981 I was hospitalized for three months due to pleurisy. I had nightmares and hallucinations about pine trees. After I got out of the hospital, I began to incorporate many things with Asian aesthetics such as misshaped pine trees, cranes and elephants. In my representations – I rendered my memory and dreams with painting, video, and printing. Currently, I’m a professor at Kyoto University of Art and Design in the information design department. What’s your recent work activity? ・In charge of artwork with six fashion designers (collaboration with GUCCI, MUMU, etc) for the magazine “Wallpaper” out of England. ・Invited as a screening committee for “Area.2 world’s 100 designer” by Phaidon, England. ・Feature article and an interview for a magazine “Gunsfeldt” U.S.A.
・Exhibition for “ROCK’N’ROLL” ,which also Tony Oursler, Andy Warhol and Maple soap have exhibition, at Norrkkoping Art Museum, Sweden. ・Exhibit five new pieces for “PALP 11” which is an exhibition of 11 artists (Richard Prince, Warhol, etc) living in Oslo, Norway working for fashion and music magazines. 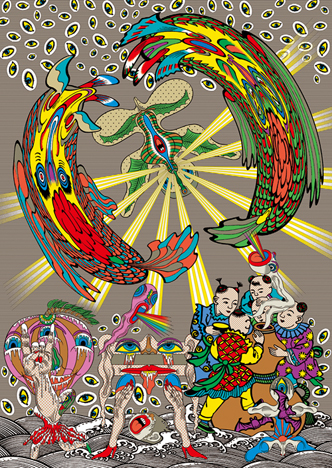 The latest anthology “LAYERS OF KEIICHI TANAAMI” (Seigensha, Inc) is now on sale. What do the 60’s represent to you? When I look back down my winding road I can see bright lights shooting from that special period in the 60’s. Everything was born in the 60’s: graphic design, editorial design, animation, experimental film, painting, printing, dimensions, and has now matured. For myself I was young and immature, but my saving grace was “going for it.” The excitement of the period was pushing me in the back and kept propelling me forward. That was my 60’s. Please tell me about animation production. The basics of my animation are monochrome, like the Mickey Mouse and the Betty Boop sketches. I still remember how much fun it was to project my hand made paper-film by using a tin made magic lantern. Every one of my works in drawing and graphic design…every expression, has a premise to its motion; and I think every one of them has a moment of movement. An animation that “gives a life is still an image” and is the foundation of all my creations. 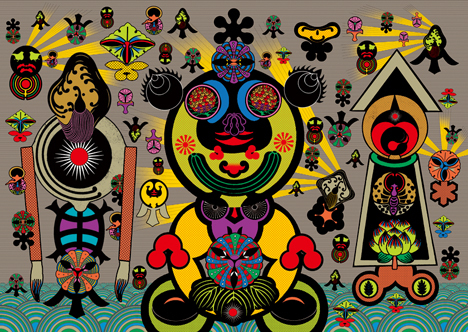 Please tell me about your exciting collaborations with Naohiro Ukawa. I have been doing a lot of work with him including: Exhibitions at Kirin Plaza in Osaka; The visual work and CD cover design for Supercar; Some videos; A live painting video for Yamaha and so on. We always have a lot of fun collaborating and work without regard to age. It’s very thrilling and full of variety. We don’t have generational commonalities or for that matter environment and experiences, but for me it is very interesting. He rarely throws an easy ball. Actually it’s mostly unexpected balls all the time. Sometimes it would be a dangerous one or almost an invisible fast- ball. I’m looking forward to presenting more radical and exciting performances with him. Why do crests appeal to you? Different from European crests, everyone could have their own crest in Japan. Arranging crests became popular, as they have been arranged in thousands of different ways resembling varieties of shapes like animals, plants, the sun, clouds, thunder, waves, and words. The interesting thing is, I was told that this couple got married, and that they each had their own crest, so they ended up having a new crest that combined their original crests. Isn’t that romantic? And, people could design their own crest if they don’t know theirs. So crests today survive after all the different arrangements have been made. This has made the Japanese crest interesting. No one ever hears about crest designers. There is no literature. However, each crest design today is of extraordinary high design. For example, there are thousands of corporation logos that have the idea of crests. Even Louis Vuitton’s monogram is an arrangement of Japanese crests. Crests have so much power as a design source. I also often get ideas from them. Probably, it is very hard to make something like this high design even for the designers now. Really, this is well-developed as if they reached the highest point…what great craftsmanship. Lastly, do you have a message for the readers? My motto is “Do what I like, in a way I like”. I’m affected by Taro Okamoto’s remarks and books that I used to enjoy in my youth, and there is a lot of power in ‘living my life now’. The meaning of these words themselves are easy to take, but the substance is very difficult to understand. First of all, it is hard to find what you like to do, and it is more difficult to get a job that you like and keep it. Then to “do that in a way you like” would be a Herculean task. You must have talent and make more effort than others. Human relationship is also an important factor. To live as you like could be the hardest thing. However, if you ever get a life like that, it would be the happiest thing for people, I believe. I’d love for young people to try this.